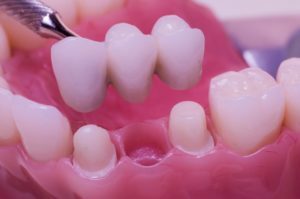 A dental bridge literally bridges the gap between one or more missing teeth. In a three-unit bridge, an artificial tooth is connected on each end to crowns. The crowns are placed over the neighboring teeth to hold the bridge in place. This bridge is custom-made for you utilizing a dental laboratory, so it takes two appointments to complete. On your first visit, we will remove any decay and shape the teeth that will be supporting the bridge. We then make an impression of your teeth. A model of your mouth is made from this impression, and then the lab uses the model to create a bridge that precisely fits your teeth and bite. In the meantime, you will wear a temporary bridge fabricated from acrylic. On your next visit, we remove the temporary bridge and begin a series of steps to confirm the fit of your new bridge. When everything is right, we permanently bond the bridge in place. Give our office a call (440-282-2023) if you have any question regarding a dental bridge or other tooth replacement options. You may also contact us using our online form to reserve an appointment today.